UDM Downloads > Easy Way to Build MySQL Client Programs! Would you like to know how to create MySQL client applications using Visual C++ with MySQL C API? What is MySQL? The MySQL database server is the world's most popular open source database. Its C API allows you to easily create clients that accesses the database, either on a local computer, LAN or the Internet. If you are looking for a full example source code for a complete MFC C++ program that uses the MySQL C API to access a MySQL database, then this package is for you. 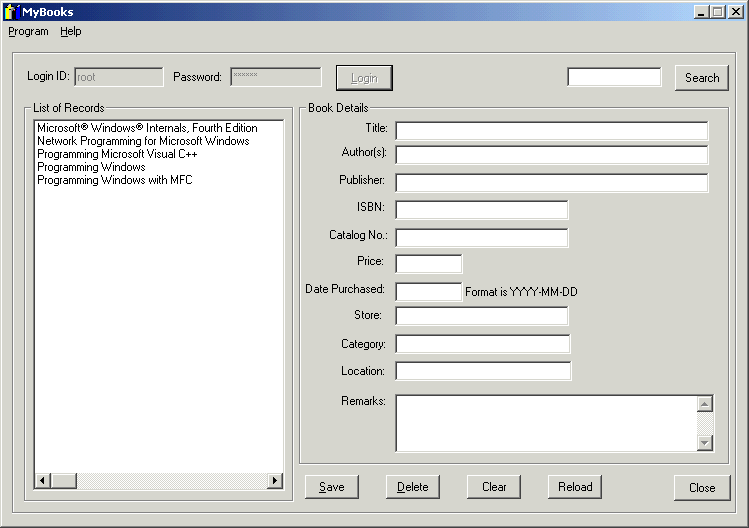 MyBooks Example Source Codes Package Here's what you'll learn from this package. 1. How to integrate MFC code with C code. 2. How to use a ListBox control 3. How to enable and disable command buttons 4. How to coordinate the interactions between listbox, edit input fields and command buttons 5. Input validation for blanks, numerical data and dates 6. How to implement wildcard searches 7. How to connect to a MySQL server using the C API 8. How to create SQL statements to add, edit, delete and search data 9. How to use the MySQL C API functions to add, edit, delete and searchdata 10. How to escape problematic characters like apostrophe in text strings. 11. How to check for duplicate keys 12. How to use HTML Help in your MFC program.